Holy Week, Sunday April 21st - Sunday 28th - Pascha and a selection of Holy Week services will be served at St. Juvenaly by Fr. John Schroedel. 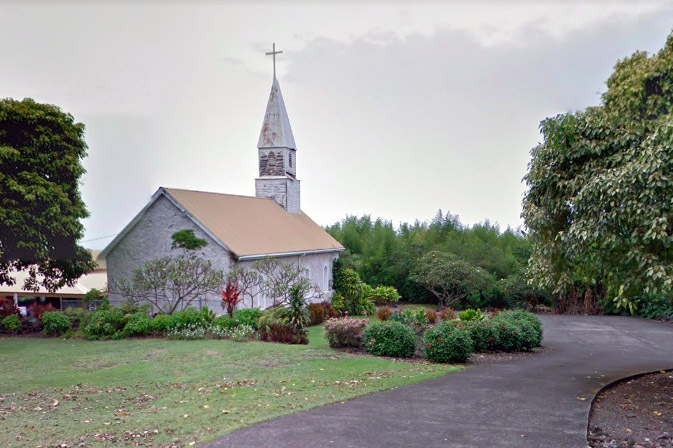 If you are vacationing or spending time on the Big Island of Hawaii, please join us for worship and fellowship. We’d love to see you! Special services and other events are generally announced by email and on Sundays. If you would like to confirm what is happening at any particular time, please don’t hesitate to contact us. We meet in the pavilion at the old St. Paul’s church, 79-7234 St Paul Rd. in Honalo. Saint Paul Road is just south of the Honalo Business Center (near Teshima's) on the makai side. Drive slowly down this road! If you are new to Orthodoxy, just curious, and want to stop by please do come. Our community enjoys meeting new people, and talking story over a cup of coffee and some food after our Sunday services. Many people have found Frederica Matthewes-Green’s article “12 Things I Wish I'd Known...” helpful. It’s written for people visiting an Orthodox church for the first time. Don’t be worried about not following along with the practices of the community. It's fine just to come and observe. One important thing to know is that the Orthodox Church does not practice what is sometimes called “open communion.” We ask that if you aren't Orthodox, you not approach the chalice for Communion. Don't be surprised, however, if you're offered some blessed bread, called “antidoron,” which is an expression of our hospitality. From time to time, visitors to the Island ask about baptisms and weddings. We are generally happy to provide this as an extension of the life of your local parish and with the blessing of your parish priest. Please contact us for more information. There is no charge for sacraments. Donations are appreciated.